What does the Kleinert method refer to? In which cases is the Kleinert aftercare method indicated? How long is the recovery period as far as introducing the healing flexor tendon to everyday strain? Through a series of studies in the early seventies, the American hand surgeon Kleinert proved that the aftercare protocol he developed to treat flexor tendon injuries would allow to perform primary surgeries even on the most inconvenient ruptures while achieving positive results. Allowing the patient full mobility would lead to the rupture of the suture mark due to an unwanted traction. Forbidding the patient from moving at all, would allow the suture mark of the flexor tendon to heal but the downside of it would be the formation of adhesion between the suture mark and the tendon sheath. This adhesion would inevitably lead to a compromised gliding motion of the tendon. The final result would be an intact flexor tendon at the expense of the mobility of the finger. 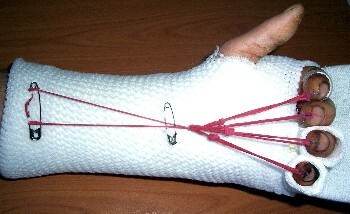 The immobilization of the injured hand in a flexed position along with the passive mobilization of the fingertips through rubber-band traction. The rubber-band traction allows the fingers to flex without using any self-guided power transmission stemming from the flexor muscles. An active flexing of the extensor tendons will now allow the flexor tendon to smoothly glide (thus avoiding harmful adhesions). When relaxing the fingers after the flexing motion, the rubber-band pulley system bends the fingers allowing the tendon to passively glide along. This ingenious idea prevents any traction to the flexor tendon suture mark while at the same time allowing mobility through the rubber-band traction thus preventing the flexor tendon to remain still in one spot where it could form unwanted adhesions with the surrounding tissue. The fingers may actively be stretched out. To achieve that, the extensor muscles are being flexed. The flexor tendon is allowed to move but without having to tense up the flexor muscles. The suture mark of the flexor tendons is not exposed to noteworthy traction. Once the injured patient relaxes all muscles of the forearm, the rubber-band traction will flex the fingers, allowing the flexor tendons to passively glide along. Once again, the suture mark of the flexor tendons is not exposed to noteworthy traction. Most of the injuries to flexor tendons in the fingers call for the Kleinert procedure within the first week. The Kleinert aftercare method should not be applied when primary collateral injuries to nerves, blood vessels or bones have been diagnosed or in cases of severe soft tissue damages. As a rule of thumb the Kleinert aftercare procedure is the method of choice when treating injuries in fingers. Isolated injuries of the flexor tendon in the thumb however could provide less undisputed results. Not few hand surgeons will opt for an extended immobilization of the flexor tendon of the thumb. The convalescence period in a case of flexor tendon injury is fairly long. This is the only way to achieve the best possible therapy result. 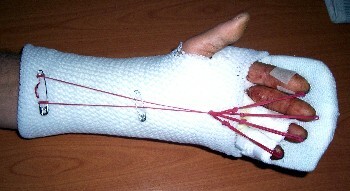 The splinting period typically last between five to six weeks. After that, active exercises are permitted; however, during the first three months it is important to avoid excessive straining in order to avoid secondary ruptures of the sutured flexor tendons. Accident-prone sport activities (like for example those that involve a ball) should be completely avoided during the convalescence period.